In late September, Volkswagen admitted to using software that activated hardware to scrub nitrogen oxide (NOx) emissions during required emissions tests, but not during normal driving. The deception improved the cars’ gas mileage at the cost of emitting between 10 and 40 times the legal limit of NOx, a precursor gas to nitrogen dioxide (NO2), ammonia (NH3), and other gases that cause respiratory problems. In the last few years, newly maturing instruments of several kinds have converged on a single message: diesel exhaust in the real world is far higher than what carmakers advertise and what is permitted by the law in many countries. 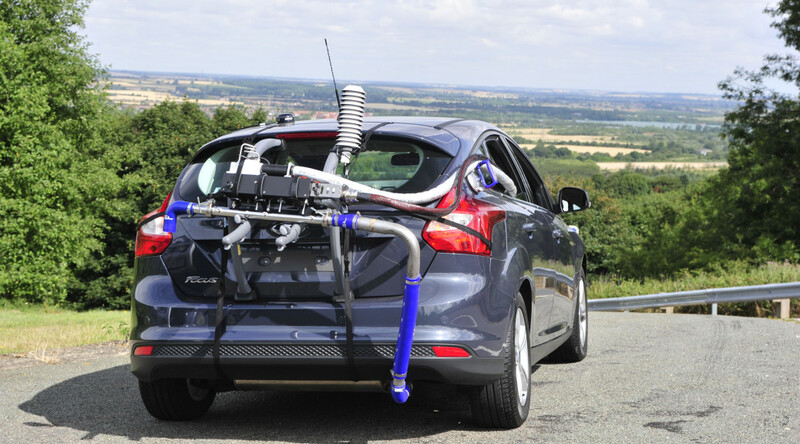 Researchers from the International Council on Clean Transportation (ICCT), a non-profit, and West Virginia University used instruments called portable emissions measurement systems (PEMS) to bypass several test cars’ onboard computers and measure road emissions before tipping off the EPA. While PEMS dates back over a decade, it and several other new types of increasingly affordable instruments are playing a growing role in uncovering industry practices and will be part of future emissions testing. “There’s just been a general improvement in instrumentation,” says atmospheric chemist David Carslaw of York University in England. In order to conduct what may be the most comprehensive study so far of a city’s road-traffic NOx pollution, Carslaw and a colleague relied on roadside spectrometers, which use light to remotely detect the presence of molecules in a gas. The instruments are now more portable and affordable than ever. They tracked three types of nitrogen emissions (NO, NO2, and NH3), along with SO2, CO, and other gases for almost 70,000 vehicles in London. The chemists conclude that despite a dramatic tightening in emissions rules, real-world emissions in diesel vehicles remain almost unchanged over the 15 to 20 model years through 2012. London, like almost all major European cities, continues to be in violation of European rules on atmospheric levels of NO2, a byproduct of NOx emissions. Roadside instruments such as those used by Carslaw offer the advantage of allowing researchers to quickly sample a large number of cars at well-defined locations without plugging into the cars’ computers. However, they reveal only an instantaneous portrait of any one car’s emissions, and most of the cars tend to be doing the same type of driving: either accelerating, cruising, or decelerating. Capturing any individual car’s emissions over a typical driving cycle requires installing hardware such as PEMS on the car itself, with a tube carrying gases from the tailpipe to the PEMS unit. Yet relying in part on PEMS studies, a September report by the non-profit group Transport & Environment found that just one in 10 new diesel cars tested met the so-called Euro 6 emissions standard that went into force that month. Since results depend on everything from weather to traffic conditions, manufacturers have long insisted on laboratory testing to get new models certified. “It’s important to have some sort of level playing field for the manufacturers,” Carslaw says. So regulators have defined standard test cycles that include acceleration, cruising, and deceleration on a kind of laboratory treadmill. Manufacturers or subcontractors must only report such indoor performance. Yet researchers have long suspected that carmakers were adapting their engines and onboard computers to score well on out-of-date but still-legal test cycles at the cost of real-world performance. The practice is called cycle-beating and involves more cynicism than deception, since the cars, technically, comply with the letter of the law. In a study separate from its Volkswagen exposé last month, the ICCT reported that in a test of 32 diesel cars from ten different manufacturers, all but one model could pass today’s NOx standard. But the cars performed much worse against a newer standard that is more representative of today’s typical driving patterns. One model emitted 15 times the new NOx limit that will go into effect in the European Union in 2017. “When you regulate something, you want to physically measure it and be as independent from the car’s electronic system as you can. There’s a big risk that as soon as you plug into the ports of a car you are effectively warning the car that you are measuring it,” says ICCT emissions researcher Vincent Franco. Such studies suggest that carmakers and regulators are far from finished resolving their emissions issues. The United States Environmental Protection Agency (EPA) may force a recall of almost half a million cars. National regulators elsewhere are now investigating Volkswagen, which has admitted that 11 million cars worldwide contain the suspect software, and those agencies must re-examine other carmakers and the wider impact of their lax oversight. “The other half of the story is how do we assess the impact, including health,” says Griša Močnik, chief scientist at Aerosol, an instrument company in Ljubljana, Slovenia. While a global tally will be difficult to obtain, one recent study pointed to NO2 exposure as the cause of 5,900 deaths in London alone.